Indonesia has won its bid to be one of the Non-Permanent Members of the United Nations Security Council. Hopefully Indonesia can continue playing active roles and contributing further to the work of the UN in ensuring world peace. It was an unforgettable journey involving hard works, non-stop negotiations, shuttle diplomacy and a mix of endless fun, tears, and joy! I'm honored to be part of the journey and hopefully my small contribution to the whole process help. 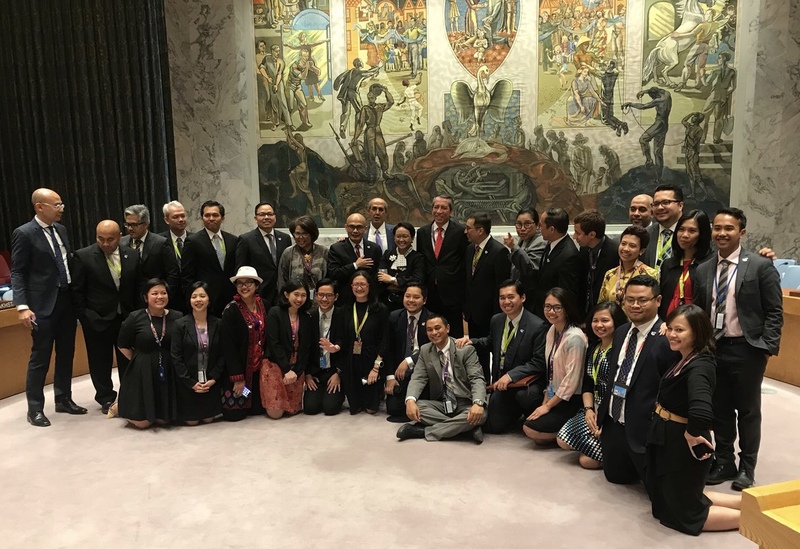 We can smilingly remember all those coordinating meetings, receptions, coffee and tea events, Angklung performance, and more. Now we are gearing up for the future works lie ahead and I wish the new team all the best, as I'm heading back to my capital this summer. Bon courage, guys! Happy to invite you to join our weekly party with Oh My Heartsie Girls and enjoy! Way to go Indonesia! World peace is what I'm for! I'm with Alissa. I wish for world peace as well. Congrats again to Indonesia! It's great news! Congratulations to Indonesia. Thank you Klara...and have a wonderful week! Hope all is well! Thanks for the well wishes..